Where will the first Hyperloop be? So far there are plans to use the tubular transportation system to move passengers in Slovakia and freight at the Port of Los Angeles. But a proposed application for the Hyperloop announced today could solve a transportation conundrum that has been challenging planners for centuries: Connecting the neighbouring nations of Sweden and Finland. The first full-scale feasibility study of the technology published today by Hyperloop One (the Hyperloop startup that recently conducted that big Vegas demonstration), looks at connecting the cities of Stockholm and Helsinki via Hyperloop. Right now, it’s not particularly easy to get between the two capital cities, which are about 300 miles away from each other: People either must take a 3.5-hour flight or an overnight ferry. This would turn the journey into a 28-minute Hyperloop ride—and freight could travel the same way. The value of time saved by the network is an astounding 321 million Euros per year. Revenue for the complete system is estimated to be 1 billion Euros per year with an operating profit of 800 million Euros based on a forecast of 43 million passenger trips a year. 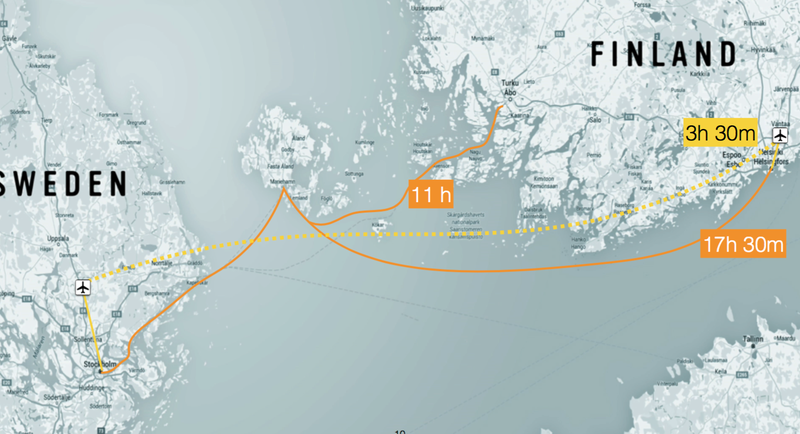 The tubes would be installed in trenches and along the sea floor of the Baltic, requiring minimal tunneling, which Hyperloop One claims will keep costs down to only 19 billion Euros. If that seems cheap, Hyperloop One has always said its cost for Hyperloop is less per-mile than high-speed rail (by some estimates it would be about half the cost). But in the case of the Helsinki to Stockholm route, high-speed rail isn’t really an option—unless the countries built a very very very long bridge then a very very very fast train. The only feasible way to shorten these times would be with a faster boat or a faster plane. This is why connecting Sweden to Finland is such a perfect place to showcase Hyperloop’s capabilities. There’s no doubt the economic impact of building better transportation solutions that can shorten travel times between cities, or unite many cities into one mega-region, like what China is doing around Beijing. This is also happening elsewhere in the Baltic to overcome geographical inconveniences—it’s the same reason that Sweden and Denmark are working to connect Malmo and Copenhagen into a mega-region named Øresund, using similarly ambitious infrastructural projects.